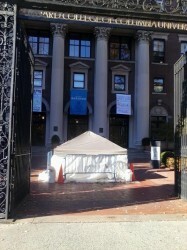 Barnard students have been puzzled for about a week by the presence of a large, ugly white tent right inside the gates. 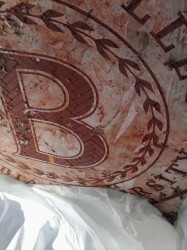 What is Barnard hiding? A fissure leading straight to the center of the earth? An uprising of mole people? Bwog snuck a photo through a crack between the tarps… They’re putting a sweet Barnard crest on the ground! According to a tipster, this is Barnard’s new logo for its 125th anniversary next year, and there will soon also be new markers and flags on Broadway. @Anonymous Is this what Google is doing in SF Bay in their mysterious building too? @Bolin So… mole people are giving Barnard a new crest? The better question is why isn’t Millie a part of the logo? @BC15 Any idea when they’re taking away the tent, though? Any big occasions or ceremonies coming up? @Dat Budget Tho Perfect use for all that extra money they apparently have, right?